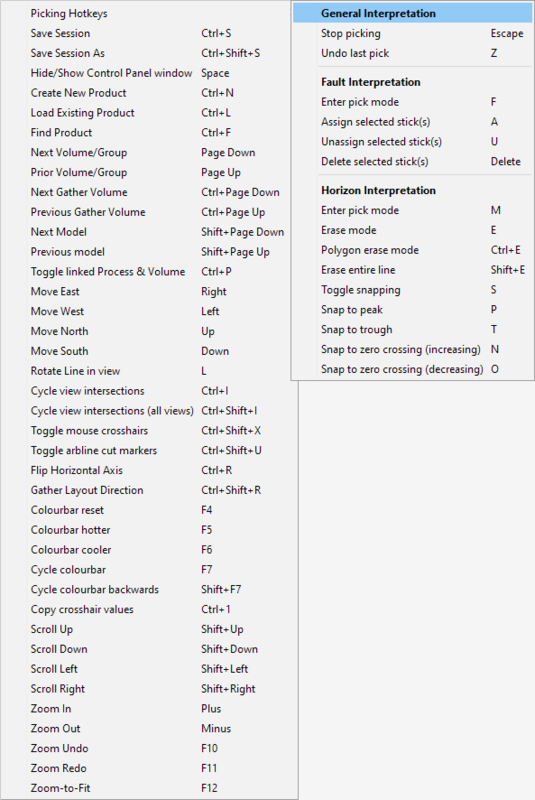 The Hotkey menu in the Control Panel displays a list of quick navigation items, along with their associated keyboard shortcuts. As you become more proficient with the software, you will probably rely less on this menu and opt to use the keyboard shortcuts instead. In the Control Panel, open the Hotkey menu. 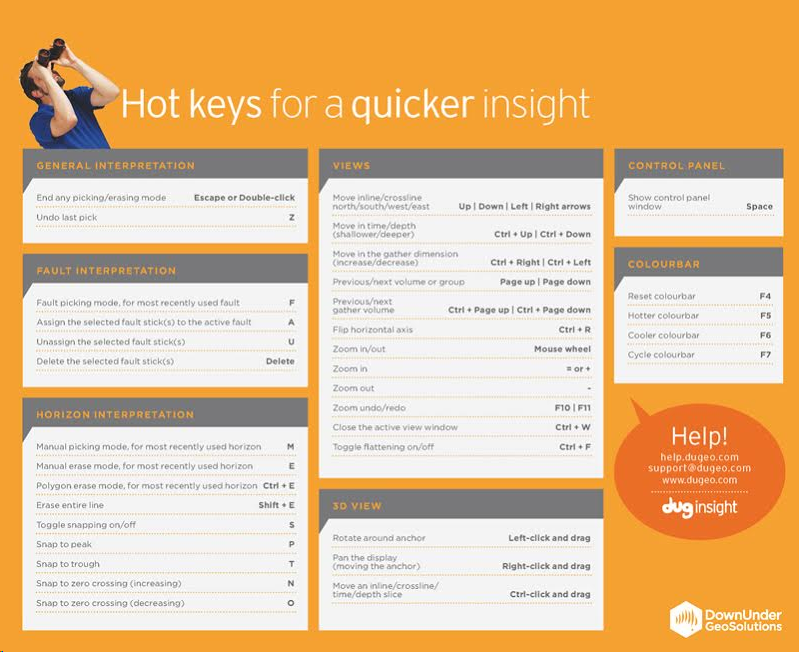 The list of hotkeys available in Insight will be displayed. The following describes each hotkey and its corresponding action. Ctrl + S - Hold Ctrl and press S to quicksave the current session. Ctrl + Shift + S - Hold Ctrl and Shift, and press S to save the session as a different session. Ctrl + N - To show the create item window. Ctrl + L - To display the load item window. Ctrl + F - To search for items with matching names in a tab. Page Down/Page Up - Press Page Down/Page Up to to display the next/previous active volume or group. Ctrl + Page Down/Ctrl + Page Up - Hold down Ctrl and press Page Down/Page Up to display the next/previous gather volume. Shift + Page Down/Shift + Page Up - Hold down Shift and press Page Down/Page Up to display the next/previous active model. Right/Left/Up/Down - Press the Right/Left/Up/Down arrow keys to move location to previous crossline, next crossline, next inline, or previous inline, respectively. The size of the movement is equal to the increment entered in the navigation bar. For 2D views, Right/Left now move the selected cmp, and Up/Down go the the next 2D line north/south. Ctrl + Shift + I or Ctrl + I - Hold Ctrl (and Shift), and press I to cycle through view intersections. Ctrl + Shift + X - Hold Ctrl and Shift, and press X to toggle the display of the green mouse crosshairs. Ctrl + Shift + U - Hold Ctrl and Shift, and press U to toggle the display of the blue arbline bend markers in the arbline view. Ctrl + P - To switch between process and the virtual volume. Ctrl + R - Hold down Ctrl and press R to flip the display of a section view on its horizontal axis. With this hotkey, you can easily change the display of a section view from the direction of left-to-right to right-to-left, and vice versa in the 2D Line View, Arbline View and IL/CL View. In Well Correlation, the hotkey will reverse the order of wells displayed in the view. F4 - Press F4 to reset the colourbar min/max range to its default range. F5/F6 - Press F5 or F6 to adjust the colourbar range of the currently selected volume to make the image hotter (more contrast) or cooler (less contrast). F7/Shift+F7 - Press F7 or Shift+F7 to cycle through the installed colourbars. Ctrl + 1 - Hold Ctrl and press 1 to copy the crosshair values at the current location to the clipboard. Paste the content into Excel, Notepad, or any documentation software. Shift + Up/Down/Left/Right - Hold Shift and press the up/down/left/right arrow keys to scroll up/down/left/right respectively. Plus/Minus - Press Plus(+)/Minus(-) to zoom in and out of views. Click on Picking Hotkeys in the Hotkey menu to open the list of hotkeys that can aid you when picking faults or horizons. Escape - Press Esc to disable the picking mode. Z - Press Z to undo the latest pick. F - Press F to enter the fault picking mode. A - Press A to move/assign a fault stick(s) to another fault set. U - Press U to unassign the active fault stick(s). Delete - Press Delete to remove the selected fault stick(s). M - Press M to enter the horizon manual picking mode. E - Press E to enable the horizon manual erase mode. Ctrl + E - Hold Ctrl and press E to enable the horizon polygon erase mode when you are in the horizon manual picking mode or erase mode. Shift + E - Hold Shift and press E to erase the entire horizon line that you picked when you are in the horizon manual picking mode or erase mode. S - Press S while in picking mode to enable/disable the snap feature when you are in the horizon manual picking mode. P - Press P while in picking mode to change the event type to Positive Event to allow the picker to snap to peak. T - Press T while in picking mode to change the event type to Negative Event to allow the picker to snap to trough. N - Press N while in picking mode to change the event type to Zero Increasing to allow the picker to snap to zero crossing (increasing). O - Press O while in picking mode to change the event type to Zero Decreasing to allow the picker to snap to zero crossing (decreasing). Ctrl+W (Windows)/Cmd+W (Mac) - Hold down Ctrl and press W to close the active window in a Windows machine. For the same action in a Mac, hold down Cmd and press W.
Ctrl+Z - Hold down Ctrl and press Z to undo the horizon erase since you enabled the horizon eraser mode. Once you disable the eraser mode, you cannot undo the horizon erase. Ctrl+Y- Hold down Ctrl and press Y to redo the horizon erase you just undid. Once you disable the eraser mode, you cannot redo the horizon erase. Double-click - Double-click to stop adding horizon seeds and picking fault sticks, polygon, arbline, probe and horizon manually. You can also double-click to stop erasing the horizon. Ctrl+Q - Hold down Ctrl and press Q to exit Insight. H - Press H while in 3D View to view from directly above (N 0o). Alternatively, click on the Home icon in the 3D View navigation bar to reset the view. Note: When you click on a text field in Insight, it selects all the text inside. Since Linux by default automatically copies any selected text to the selection clipboard, Insight is designed to preserve the existing selection clipboard instead of overwriting it. For Linux users who want to copy the text in a text field, double-click the desired text and use the middle-mouse button to paste.